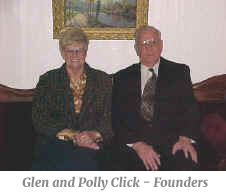 Click Funeral Home was established in 1965 by Glenn Click and his wife Polly with a dream, a prayer, and a commitment from the family to lots of hard work. Born in Monroe County, Glenn Click was raised on a farm, but became interested in the funeral business while attending McMinn County High School. Evans Funeral Home was located near the high school. Through his association with its owner, Glenn found not only his career path, but his calling. After high school graduation, Glenn attended the John A. Gupton School of Mortuary Science in Nashville. There he met and married Polly McCosh who was attending Treveca College. 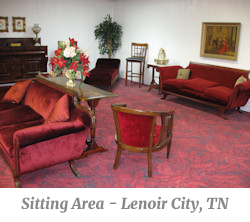 After his graduation from Gupton's in 1949, Glenn moved to Lenoir City to work for Guy F. Tallent Funeral Home. During the sixteen year tenure at Tallent, Glenn and Polly learned the funeral business and had their family of three boys and a girl, Eddie, Stevie, Larry, and Glenda. After Mr. Tallent's retirement in 1965, the funeral home was sold to Cecil Karnes of Quinn and Karnes Funeral Home in Loudon. At this time, Glenn and Polly made a courageous decision to start their own business. Their lack of financial assets was outweighed by their strong faith and tremendous commitment to hard work and service. Unlike the conventional marketing techniques seen today, Polly and Glenn took to the streets, going door to door, to make personal contact with the people of Lenoir City. They introduced themselves, their new business, and shared their genuine desire to serve the needs of each family who would put their trust in them. From this simple and honest pledge, Click Funeral Home was born. The original location of Click Funeral Home was 900 East Broadway, which is the present day site of Broadway Florist. When Walnut Street Elementary School was closed in 1972, Polly and Glenn made another bold decision to purchase the building and undertake the major renovation needed. In 1973, the transformation was complete and Click Funeral Home moved into its present location at 109 Walnut Street with the family residing underneath. Click Funeral Home has always operated as a family business. At its inception, Glenn called on his brothers J. D. and Jimmy Click to help operate the new, but fast growing business. It was during those years while the young business flourished, that Polly and Glenn faced "death" on another level with the loss of their son Stevie at the age of sixteen. A few months later their fifth son, Tim, was born, and brought new life to the family, while Stevie continued to live on in the hearts of everyone who knew him. As Polly and Glenn's children have literally grown up in the family business, it is no surprise that each of them have chosen the Funeral Home as their life's work. Glenn Click passed away in September 2008. His family members continue the tradition of excellent, personal, caring service started by their father and grandfather.